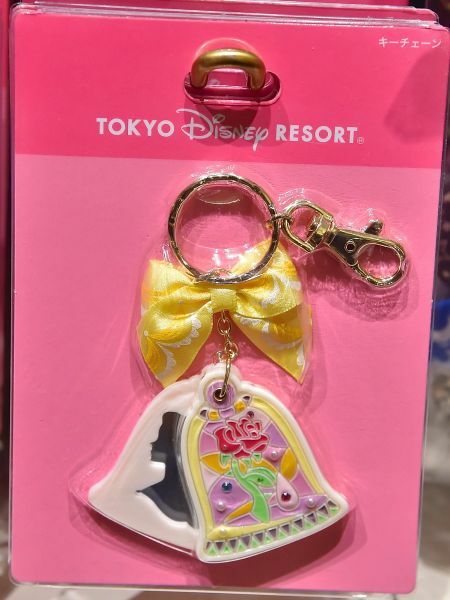 Tokyo Disney has recently seen a rise in Princess-related merchandise in greater varieties. Among the latest are keychain mirrors, but it’s the design that makes it more than your average pocket product. 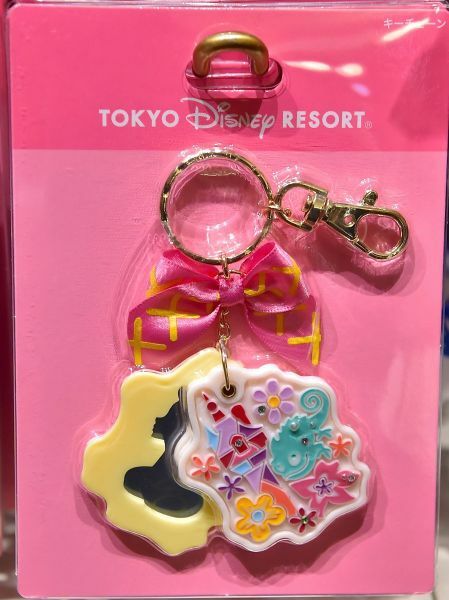 Usually it’s Cinderella/Ariel/Rapunzel who gets the spotlight at Tokyo Disney so it’s a real treat to see other princesses released for a given product. 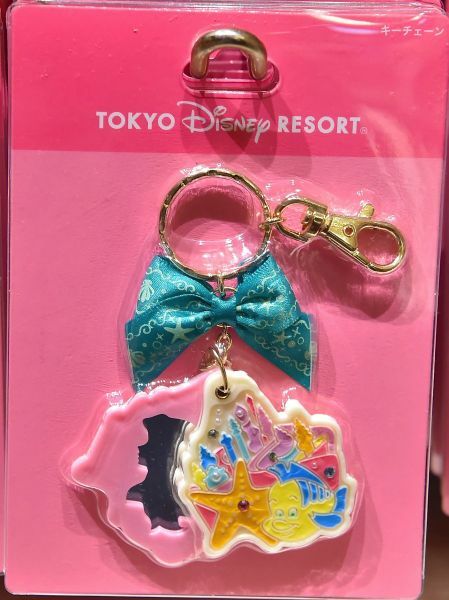 These gorgeous keychain mirrors come in five choices of your princess pick. The mirrors are a two-fold design – the bottom plate contains the mirror itself and the upper plate slides over the bottom one to shield it. The inner plate contains a mirror in the shape of a featured princess and the upper plate depicts a representative mosaic in soft pastel colors. To top it all off is a silk bow in a color that best represents the princess’s usual attire. Snow White is the only princess of the bunch whose front plate features the princess herself. She poses with a red apple in a frame reminiscent of the Magic Mirror. Small jewels decorate the background. The ribbon resembles her puffy sleeves in its distinctive blue and red. Cinderella peers from inside the renowned magicked pumpkin carriage. Jewels decorate the front wheel and the rear wall of the carriage. The blue ribbon has feminine swirls and curves in tune with the magical happenings of that fateful night. Belle is naturally followed by the enchanted rose. The yellow ribbon has designs of lace and draping cloth similar to her ballroom gown. Along with Rapunzel, Ariel’s sidekick joins the front plate in the foreground while the Atlantica palace sits in the background. The teal ribbon has marine motifs in starfishes and shells. Rapunzel has her trusty partner Pascal on the front and the tower behind. The rest of the background space is filled by various flowers with jewels scattered about. The pink ribbon with yellow cross patterns is a nod to the front corset of her dress. 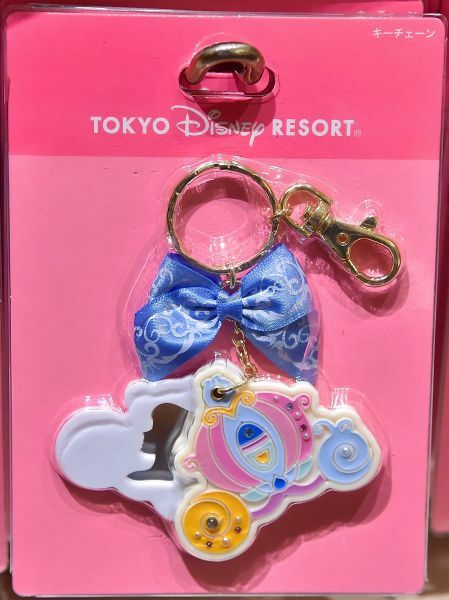 Each portable mirror retails at the cost of 1400 yen and can be found at both Disney Sea and Disneyland parks. 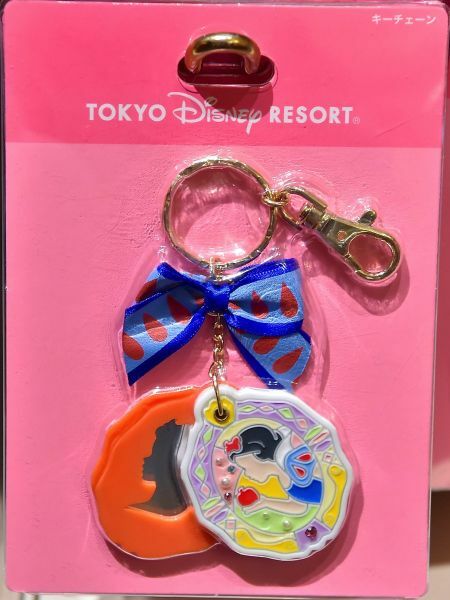 Merchandise © Disney. All images credited to MezzoMiki.